Update on projects: I’m working on a short story. All of my story drafts of late have turned darker than I’d like, so this one is intentionally not dark. Seems to be going better than the others. I’m also partway through revising my next picture book. This one is a story (as opposed to The Circle Book, which was just a list of random things) and I’m excited. The urge to design a typeface for it has proven too strong to resist, though, so I’m working on that as well. The typeface is called Golly. I’ll post some screenshots soon (I’m almost done with the lowercase letters). Sidenote on type design: I built Curves (a Python library for designing type, via exporting to UFO and compiling that to OTF) to see whether designing type in code works. Turns out it doesn’t. Even with easy previews (SVG and @font-face), the cognitive gap between the code and the points seems to be a little too much. I have some other ideas for type design tools that seem more promising, though. More on that later. 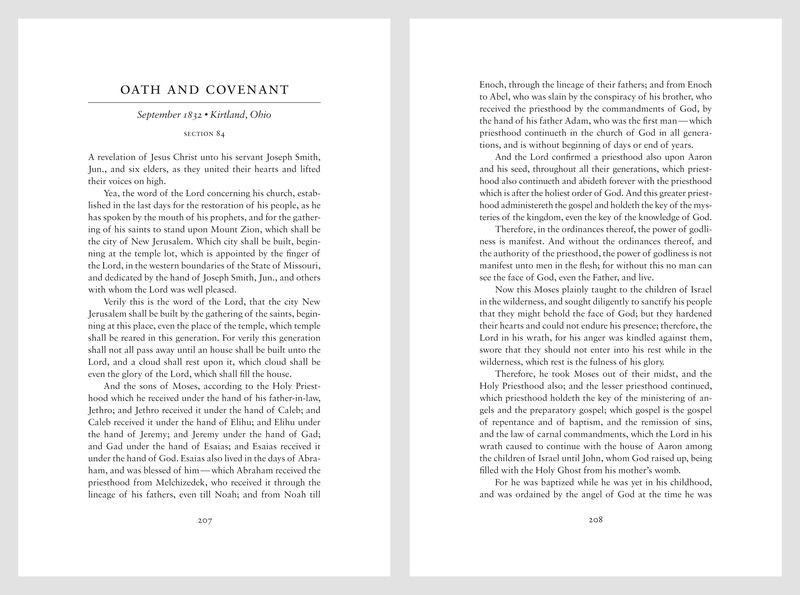 And I’m slowly working on the remaining reader’s editions (print/PDF of D&C, Pearl of Great Price, and Words of the Prophets). Also, the print edition is getting closer. I’ve been refactoring my publishing scripts to make things more seamless on my end, and that’s close to done. 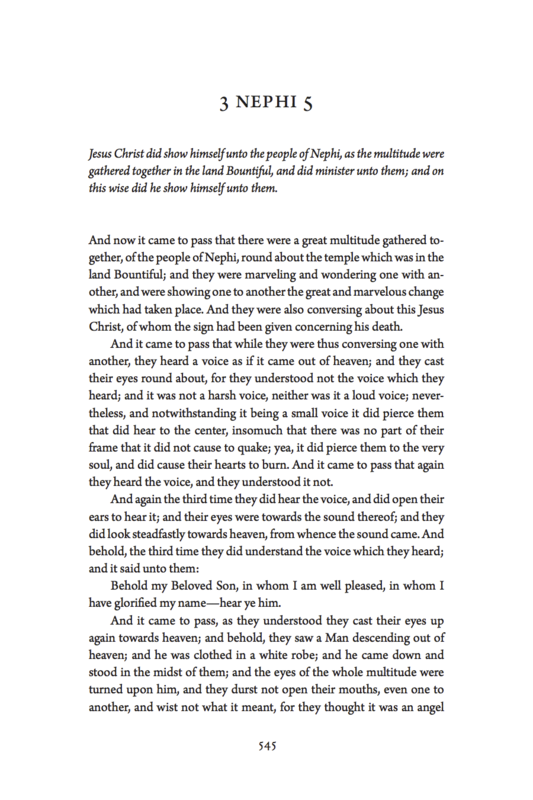 I will also be typesetting a matching, combined reader’s edition of the D&C and Pearl of Great Price. And after that, I’ll be doing a study edition of the D&C and Pearl of Great Price, as a companion piece to the Book of Mormon study edition. 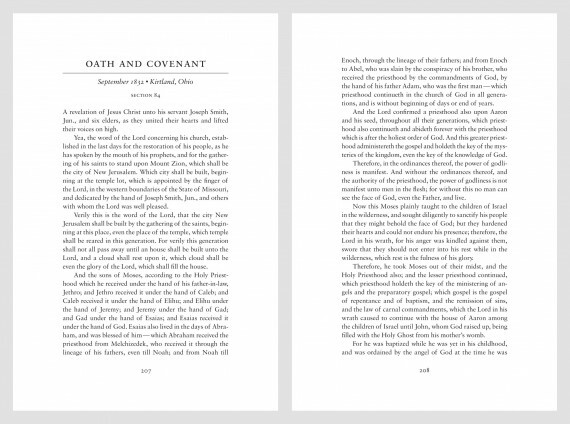 Alrighty, I’ve finished the brand new Kindle versions and updated EPUB versions of the Doctrine & Covenants reader’s edition, Pearl of Great Price reader’s edition, and Words of the Prophets (a compilation of twenty-two sermons from the Book of Mormon). Enjoy. 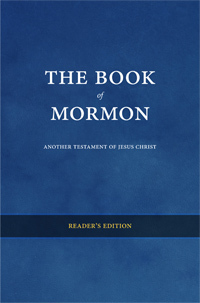 I don’t know why I didn’t do this sooner, but I’ve released the Kindle version of my Book of Mormon reader’s edition. I’ve also updated the formatting on the EPUB version so it’s nicer (indented paragraphs and all that). Kindle versions and updated EPUBs of the D&C and Pearl of Great Price will come in the near future. Maker’s note: I’m finding that my md2epub script has made EPUB production incredibly easy. Granted, I’m working with books that don’t involve charts or tables or images or pull quotes or anything complicated, just straight text, but it’s still a breeze. 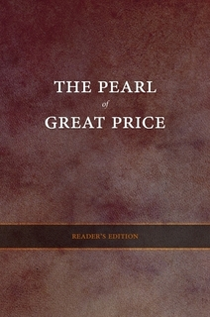 Following in the footsteps of my reader’s editions of the Book of Mormon and D&C, here’s that reader’s edition of the Pearl of Great Price I mentioned earlier. It’s available in both PDF and EPUB. You can also buy a hard copy on Lulu. Let me know if you find any typos or if the EPUB doesn’t work on your reader. 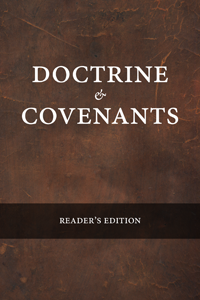 My new reader’s edition of the Doctrine and Covenants is now up and ready for download (PDF and EPUB). Basically, I’ve taken the text of the D&C, stripped out all the verse numbers, reparagraphed the text, reorganized the sections chronologically (I only had to move a handful of sections), gave each section a name (based loosely on Dane Laverty’s post, but I think I only kept around 10% of his titles), and pulled the date and place of each revelation up to make them more visible. I should add that I’ve tested the EPUB in Stanza on my iPhone and in iBooks on my iPad and it works fine in both places. Let me know if it doesn’t work on your reader (or if it looks weird).